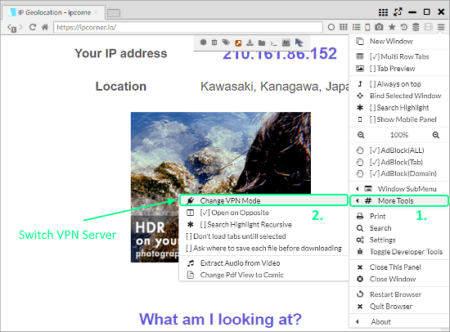 In this article, I will cover 5 free browsers with built-in VPN for Windows. Having a VPN (Virtual Private Network) gives you anonymity on the web and protects your data from data-harvesting advertisement firms and websites. A VPN can also be used to access the restricted websites in a particular region. Three of these web browsers for Windows have VPN built right into them along with other functionalities like ad-blocker, do not track, etc. One is a browser extension that adds VPN network into Google Chrome and Mozilla Firefox, and, the last one is Tor browser which doesn’t need a further explanation beyond its name. So, let’s check them out one by one. Sushi is a free cross-platform feature-rich web browser with built-in VPN. You can use it on Windows, Linux, and MacOS although the VPN feature is exclusive to Windows only. A portable version is also available for all these platforms. You can install the regular version on your computer or run the portable version to use this browser. By default, the VPN is disabled initially, you can turn it on by selecting a VPN server from Menu -> More Tools -> Change VPN Mode. This browser offers over 100 VPN servers from all around the world. It shows the region, port number, speed, and ping time for each server alongside their names. When you choose a server, it takes a few seconds to connect and notifies you when the connection is established. The user interface of this browser is built on the concept of maximizing web browsing efficiency. It allows you to create multiple rows of tabs and arrange them accordingly. You can snap a tab anywhere on the browser window and resize it as per your requirements. This way, you can take advantage of all the space on your screen and make your experience more efficient and productive. You can read more about this browser here. Download this free browser with built-in VPN for Windows here. Opera Browser is one and only mainstream web browser that has built-in VPN. This is also a cross-platform web browser available for Windows, MacOS, and Linux. Unlike Sushi browser, the VPN feature in Opera is available for all three platforms. To use the VPN, you have to enable it on from Settings -> Advanced -> Features -> VPN. Once enabled, it adds the VPN option in the address bar from where you can easily toggle it on/off later. You can also view your bandwidth consumption there and change the VPN location as well. 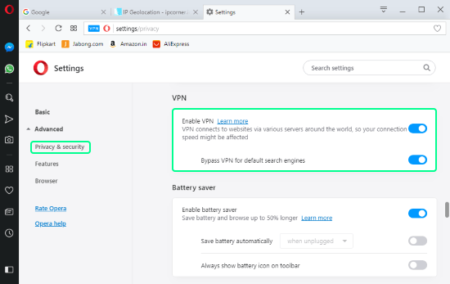 Opera also gives you an option to bypass VPN for default search engines. This browser also has built-in aggressive ad-blocker and battery saver along with other handy privacy and security options. You can download this free browser with built-in VPN for Windows from here. Epic Proxy: This is a built-in VPN option from where you can enable/disable VPN and switch VPN regions. Umbrella: This option allows you to enable/disable plugins, data encryption, and ads & tracker blocker. Epic Video Downloader: It is a built-in video downloader that can fetch videos from web pages. This browser has serious privacy-focused options. 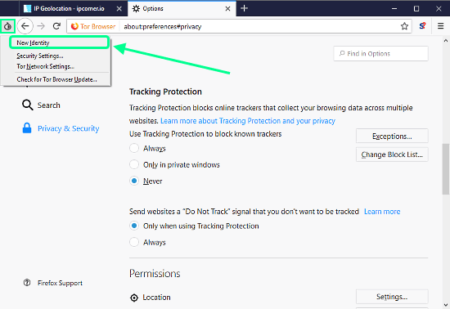 Whenever a website tries to access your history or store data, this browser blocks that and gives you a notification for that. It also has a feature that can list the websites which are spying on your other browsers. Hola is a free and secure VPN. It is available as a browser extension for Google Chrome and Mozilla Firefox. 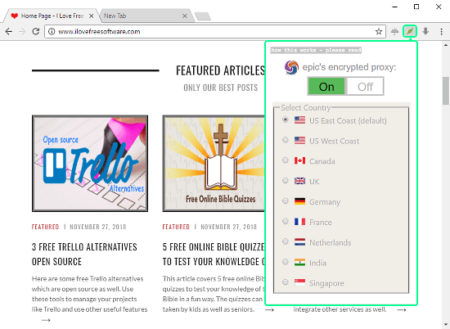 With this extension, you can add the VPN right in these mainstream web browsers. Hola sits in the address bar of your browser and doesn’t require any login or signup. You can simply click on its icon and choose a region to start the VPN. 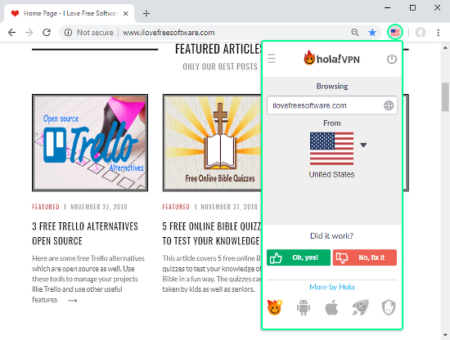 Once the VPN connection established, the Hola icon in the address bar is replaced by the selected region/country flag. Hola is as-free and offers unlimited VPN. Here is the link to add Hola to Google Chrome. Tor is a free web browser software that lets you surf the internet anonymously. It is a cross-platform software which you can use on Windows, Linux, MacOS, and Android. Tor doesn’t have a VPN function, instead, it uses a safe and secure network with advanced tracking protection to safeguard your data and privacy. It uses client-side complex data encryption to make you anonymous on the web. You can configure the tracking, website permission, and ad-blocking options as per your need in the Settings. As you can change your IP by switching the server in a VPN, Tor has a similar option to get a new identity on the web. Whenever you need that, you can get a new identity by clicking on the Tor icon from the top-left corner and selecting “New Identity“. Download Tor Browser to surf the web anonymously from here. You can use these free browser with VPN to protect your privacy and surf the web anonymously. If you need a VPN rarely then you can use Opera and Hola. But if you need VPN often then Sushi and Epic Privacy browsers a try. And, Tor is the go-to browser whenever you need anonymity.